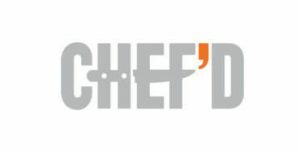 Chef’d is a meal kit service best known for its partnerships with some of the biggest names in the food and beverage industry. This time, it has partnered with Campbell’s, America’s favorite source of canned food. 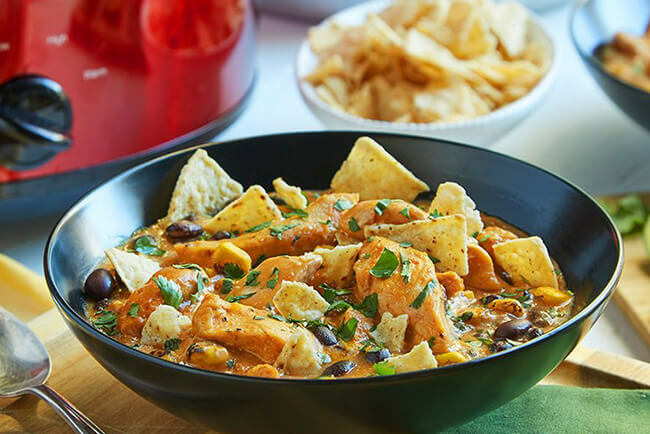 The result of this interesting partnership is an even more interesting line of meal kits featuring some of the most scrumptious slow-cooker meals we have ever seen. We have been anxiously anticipating the launch of the Campbell’s Kitchen meal kit series for nearly a year, ever since the canned food giant made a multi-million investment in Chef’d meal kit service. Now that the kits are finally on the shelves of the Chef’d online store, it is time to see what kind of deliciousness the two famous brands have cooked up for their fans. 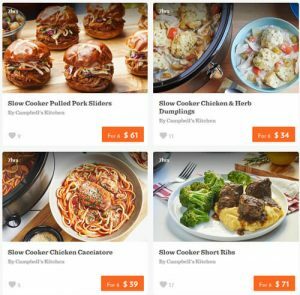 The Campbell’s Kitchen series includes 12 meal kits in total, half of them featuring slow-cooker recipes and the other half including quick-to-make dishes that are ready in just 30 to 35 minutes. The slow-cooker section includes meal kits designed for 6 people. The prep and cooking time is 7 hours, but the slow cooker does all the work while you to get to enjoy the delicate tenderness of a slow-cooked meal. The items at your disposal include pulled pork sliders with cabbage slaw and three bean salad, chicken & herb dumplings, chicken tortilla soup, chicken cacciatore, short ribs with cheesy mashed potatoes & sautéed broccoli, and shredded beef taco. The Campbell’s Kitchen meals that are both easy and quick are available in two sizes: 2-serving and 4-serving options. These 30-minute meal kits include such gourmet delights like skillet vegetable lasagna with herbed cheese, pork tenderloin with apples & mushrooms, Santa Fe chicken sauté, pan-seared Mediterranean chicken with couscous, and chicken balsamico with orzo. The prices are similar to those of other Chef’d items. If you opt for the slow cooker meal kits, you can cook up a gorgeous meal for 6 people for $34 – $71, which amounts to $5.66 – $11.83 per serving. With the 30-minute meal kits, you pay between $27 and $29 for the 2-person kits or $36 – $44 for the 4-person kits, that is, between $9 and $14.50 per serving. Whether you are looking for something luxurious or affordable, slow-cooked or quick-to-make, the Campbell’s Kitchen series can satisfy your desires. Just be sure to order soon because the kits are selling like hotcakes and Santa Fe chicken sauté is already out of stock.